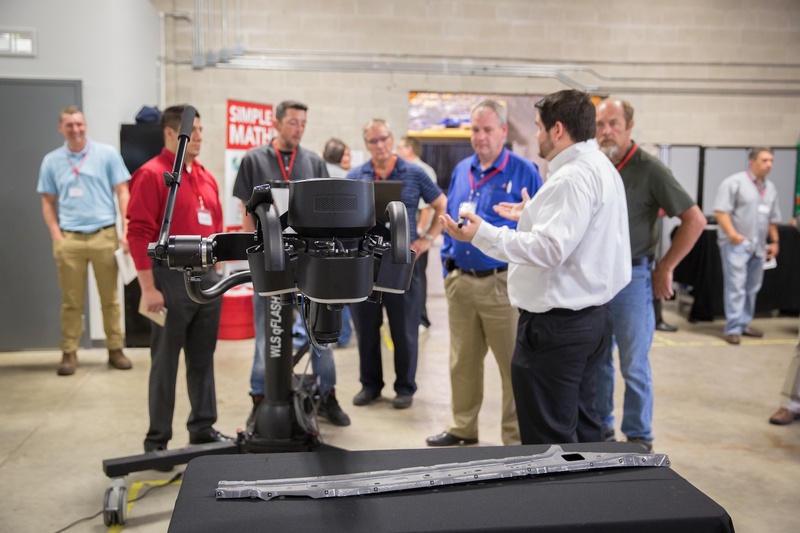 On June 23, 2016, Exact Metrology held an open house at their Brookfield, Wisconsin location, showcasing its newest products in 3D printing and CT scanning equipment. The event was attended by a large number of people from several Midwestern states and a diverse range of business sectors, including manufacturing companies, civil engineering firms, municipalities, local artists and art museums. Hosted by Dean Solberg, Exact Metrology co-president, the day included product demonstrations featuring the newest technology in 3D & CT scanners from Exact Metrology engineering specialists. Ten stations were set up throughout the facility, each demonstrating equipment from the top names in the industry and most of the equipment was available for hands-on use by the attendees. Products included the Romer measurement and scanning arm, Hexagon Q Flash, Leica tracker, Surphasers, ATOS II Blue Light Scanner, Artec Space Spider and Exact Metrology’s newest acquisition, the ProCon Compact CT scanner. Several attendees brought their own parts and had them scanned onsite, then 3D printed. Running simultaneously throughout the day were several breakout sessions on: 3D systems (Geomagic Design X/Geomagic for Solidwork) presented by Mike Tsang; 3D Software Innovmetric (Polyworks) by Julien Thibodeau Gagne; and 3D printing by Mastergraphics demonstrated by Kevin Carr. An especially impressive product demonstration included scanning a single grain of salt with the ProCon CT scanner. The scan picked up details as minute as the ridges in the salt grain, illustrating the scanner’s ability to capture the most precise details inside and out. CT scanning currently used by Exact technicians to examine injection molded parts, castings and forgings, evaluating porosity, grain structure, filament distribution etc. Data can be instantly compared to CAD files in the point cloud for assessment. ­­­­These high-definition CT imaging devices were, until recently, only available for use in the medical field. They now serve a wide range of product applications, including but not limited to, industrial, manufacturing & construction, power generation/nuclear, medical, aerospace and the arts, the latter already seeing applications in the detection of forgeries and sculpture structural integrity, as examples. Exact Metrology is an ISO 9001:2008 Certified Company. 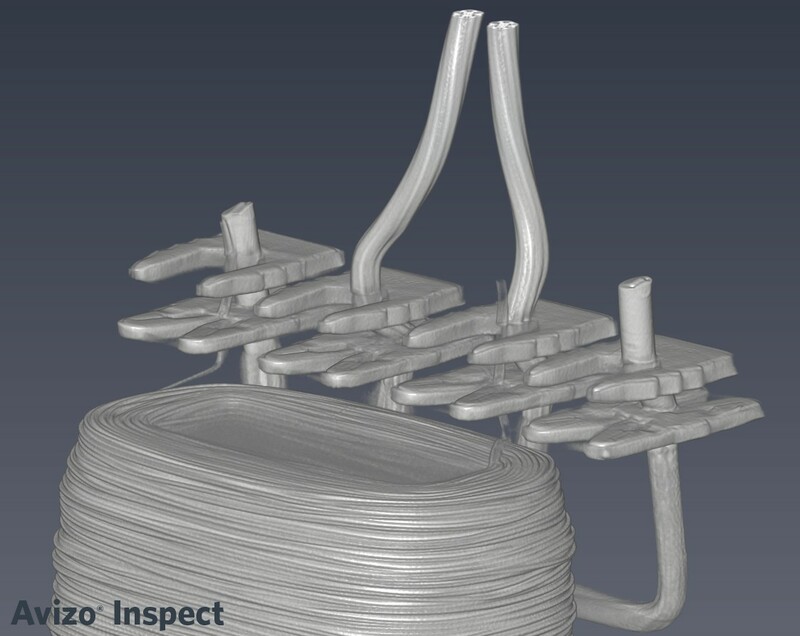 Exact Metrology, working at the company’s Brookfield, Wisconsin location, has successfully used its ProCon industrial CT scanning technology to validate the position of a wire configuration in the bobbin of an electronic lock assembly for one of its customers. By using its CT scanning technology on the completed lock assembly, Exact technicians were able to determine the wire’s precise position without the need for disassembly or other compromise on the finished article. Any deviation of the wire’s nominal position could be noted, allowing for subsequent changes in the assembly protocol, as needed. The CT scan clearly shows the path that the wire pair follows inside the lock assembly. Exact Metrology is an ISO 9001:2008 and AS9100 Certified Company. Exact Metrology, with facilities in Cincinnati and Milwaukee and affiliated offices throughout the Midwest, is a comprehensive metrology services provider, offering customers 3D and CT scanning, reverse engineering, quality inspection, product development assistance and 2D drawings. The company also provides turnkey metrology solutions, including equipment sales and lease/rental arrangements. On March 17, 2016, Exact Metrology held a tech event in Cincinnati, Ohio with partner company, 3DVision Technologies at both of their offices. Held on St. Patrick’s Day, the event was cleverly titled “Lunch, Learn & Luck,” and had a “March Madness” theme with basketball games playing on multiple widescreen televisions. The event was attended by over 100 people from local area industries, including automotive, aerospace and consumer goods. Co-Hosted by Steve Young, Exact Metrology co-founder and President, and Todd Majeski, President of 3DVision Technologies, the day included presentations and product demonstrations of the newest products transforming the manufacturing industry in 3D printing and 3D scanning. The informative event provided insight and hands-on experience, while displaying the newest technology that is reshaping the traditional manufacturing process. The day began at 3D Vision Technologies office, (a provider of engineering solutions & 3D printing for manufacturing companies), with a presentation by Todd Majeski. 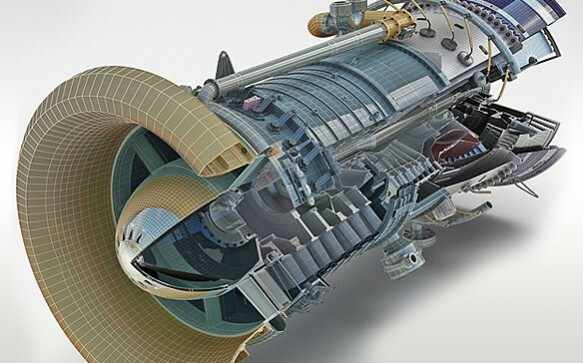 Majeski discussed the company’s long-term partnership with Exact Metrology, and how both companies work together to improve processes, increase quality, and get their customer’s products to market faster through 3D scanning and reverse engineering. After several presentations and a question-and-answer session, attendees were welcomed into a showcase of 3D printer demonstrations and product displays of printed samples from miniature to lifesize versions, including a skateboard, helmet, and an automotive front grill. The second part of the tech event was held at Exact Metrology’s office, conveniently located just a short walk away. Participants walked together and, after a St. Patrick’s Day themed lunch, began the afternoon session with a presentation by Steve Young. Young discussed the newest technology in CT (Computed Tomography) scanning systems, which allows users to not only scan the outside of a part, but to actually see inside of it without taking it apart, or damaging the item. Until recently, this technology was used primarily in the medical field but is creating much excitement within a variety of industrial markets now, as it enables manufacturers to check for defects, internal contact points after assembly, porosity and dimensional accuracy, comparing actual scans to point cloud data, CAD files etc. 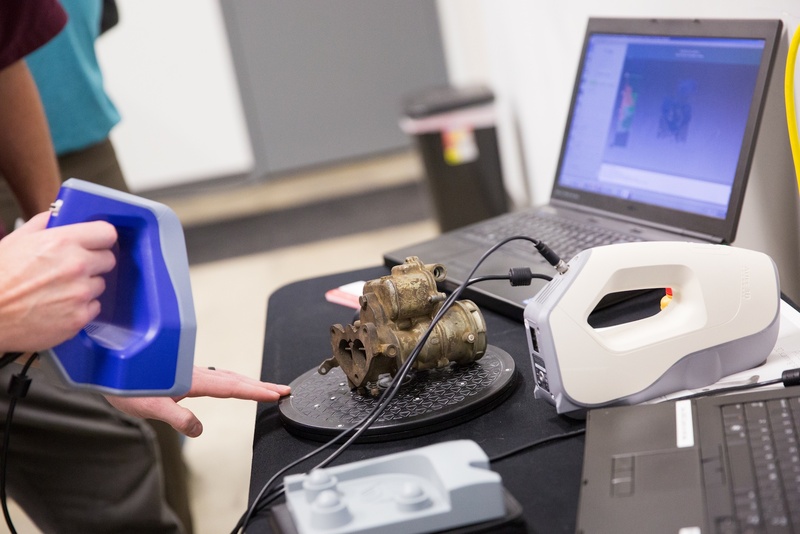 According to Young, this type of 3D scanning has been a “huge success” for his company, which he co-founded with Dean Solberg, who runs the company’s facility in the Milwaukee area. Products displayed at the event included the P40 Leica Scanner, a long-range scanner, which, according to presenter Jacob Wallace, Processing Engineer at Exact, can be set up and ready to scan in 30 seconds. The scanner has a 150-meter range and will show everything in the surrounding area. Wallace recently scanned an entire office to make an accurate 3D model, complete with windows, doors, ceiling and wall thickness. Other uses of these long-range scanners include collecting topography of roadways (without stopping traffic) and large buildings of 500,000 square ft. or more, to collect information inside and outside of the building, all within a reasonable timeframe. Josh Schradin, QA Manager, demonstrated the GE Vtomex M CT Scanner with a full rendering of a videogame controller he had previously scanned. Attendees were able to see internal components, including the smallest features on the circuit board. He explained how the scan could also be used to find defects or to process for reverse engineering. Other products displayed and discussed at the expo were the Romer Absolute 77, an Articulated Arm with a Laser Line Scanner, the Atos Triple Scan, the Artec EVA Handheld Portable Scanner and the NDI ScanTrak Large Volume Laser Scanner. Exact Metrology ended the afternoon with a St. Patrick’s Day raffle, with two lucky attendees winning a 48” high-def television and a MakerBot 3D printer. Exact Metrology offers a complete line of portable scanning and measurement technologies as well as contract measurement for 3D laser scanning services, reverse engineering services, non-contact inspection, metrology services, 3D digitizing and training. Exact Metrology, with facilities in Cincinnati and Milwaukee and affiliated offices throughout the Midwest, is a comprehensive metrology services provider, offering customers 3D scanning, reverse engineering, quality inspection, product development and 2D drawings. The company also provides turnkey metrology solutions, including equipment sales and lease/rental arrangements. Expanding on the audit process, Co-President Dean Solberg notes, “Every one of our associates realized something very special during the audit. Namely, because it was necessary that they understood the process and purpose of their work plus the issue resolution scenarios required, they appreciated their roles as interconnected team members at Exact. That’s very exciting to witness and has already raised their level of involvement in day-to-day operations.” He further observed that the audit required a new level of goal orientation, self-evaluation and awareness of improvement possibilities across the entire facility, including operations, accounting, sales, service and especially management. The AS9100 is a vital certification for the work this facility performs in the aerospace sector. Exact is a prime supplier of equipment as well as the services that utilize various portable and stationary 3D scanning devices, plus one of the first industrial-grade CT scanners, a unit that can examine the internal geometric and material composition of various substrates on molded, cast and forged products, as well as food ingredients and packaging for seal integrity and safety. Exact Metrology is also an ISO 9001:2008 Certified Company. November 30, 2015 – Exact Metrology announced today the signing of an agreement with ProCon X-Ray for exclusive rights to distribute the company’s product line throughout the USA. ProCon, located in Germany, has been developing x-ray systems for non-destructive testing since 2004. The company is a state-of-the-art manufacturer of x-ray and CT (computed tomography) systems designed specifically for industrial applications. ProCon offers several standard models, ranging from portable units and desktop models to full-size, stand-alone systems. Each of the company’s standard units can be customized to meet customer specific job requirements. The systems are all offered with high-resolution focus x-ray technology. ProCon works directly with customers to determine the scope of requirements, then develops and designs a unit to meet the individual application needs. 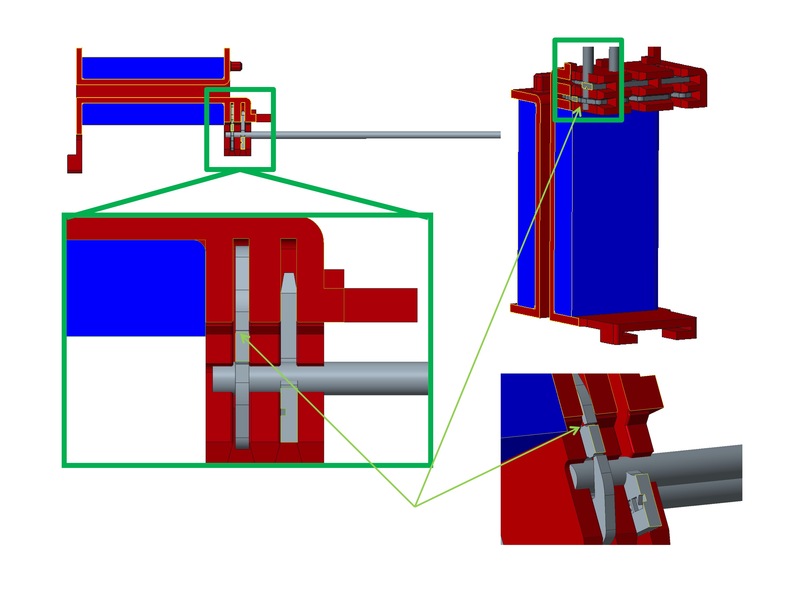 Units can be designed with multiple x-ray sources and multiple detector set-ups. This process results in customers obtaining exactly the type of metrology equipment required, without any unnecessary features. Turnaround time in production of the equipment is thereby reduced to a minimum. ProCon systems are also user-friendly and easy to use in operation, according to Exact VP Steve Young. Exact Metrology offers a complete line of portable scanning and measurement technologies, as well as contract measurement for 2 and 3D laser scanning services, reverse engineering services, non-contact inspection, metrology services, 3D digitizing and training, plus its recently announced CT scanning services, usable by all types of manufacturing, packaging and product integrity concerns.